Tag Archive | "Royal Farlowella Catfish (Sturisoma sp.)" The Royal Farlowella Catfish (Sturisoma sp.) is a sucker mouth catfish that is found in the fast flowing rivers and streams of South America and referred to by many tropical fish keeping enthusiasts as the Panama Sturisoma, Royal Whiptail Farlowella, or Royal Whiptail Catfish. The first dorsal fin of the male Royal Farlowella Catfish is extremely long. Adults have odontodes, which are bristle like extensions, that look like whiskers on their cheeks. Female Sturisoma sp. lack this feature. Royal Farlowella Catfish are a peaceful, inactive, bottom dwelling species that seldom if ever bother their tank mates. This makes them perfect community fish for a peaceful South American tropical fish keeping setup. The Royal Farlowella Cat should be housed in at least a 30 gallon tank that is densely planted and aquascaped with rocks, driftwood , and numerous caves for them to hide in. both Farlowella and Sturisoma catfish appreciate twiggy branches and bogwood in their tanks where they can spend their time resting and grazing. They are “plant friendly” and will not destroy or move around plants in a densely planted tank with a sandy or extremely fine gravel substrate. Hemiloricaria will spend most of their time on the sandy substrate, but appreciate a scattering of bogwood pieces and twiggy branches on the bottom of the tank for them to hide. Royal Farlowellas require high degree of aeration and adequate filtration to stay healthy and active. The Royal Whiptail Farlowella has been successfully bread in aquariums. The female will lay up to 60 brown to yellowish brown eggs on any clean flat surface. The male guards the eggs until they hatch; which is in approximately one week. After hatching, the fry should be feed softened spinach, kale, and small bits of pellet food. Adult Royal Farlowella Cats eat a wide range of foods and should have their diets augmented with sinking algae wafers , sinking catfish pellets, live or frozen bloodworms , crushed fish flakes, or a piece of blanched zucchini now and then. 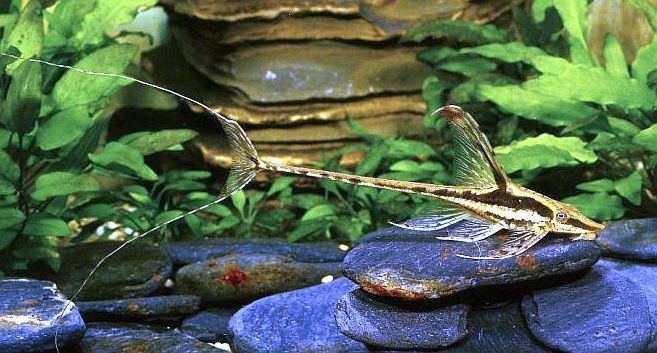 Although they grow to almost 10″ in length, Royal Farlowella Catfish are usually around 2″ to 4″ long when available for purchase. These are not commonly available in tropical fish shops and are often misnamed when offered for sale.